I finally had a chance to go to a Dharma talk and meditation class. It's Tibetan Buddhism. I found out they are building a temple nearby and will have retreats, ceremonies, talks, and general events etc. I have time to attend weekly talks. We are going through Lam Rim. There are purification day retreats coming up I can go to. Finally I can be involved in all three Jewels. Anyway, thats my blub for tonight. Later folks. Great news @Carlita! When the student is ready, the teacher will appear. ..
sounds like you'll have much to look forward to. Nice! Thank you guys! @Bunks I kept asking myself about needing a teacher. They are still reconstructing the temple. I hope I can go to the chanting event this saturday and learn more about it. @lobster thanks for the articles. I have a look see. @silver I will. I like that federica. Give them caffeine to unleash their super skills! Hey. I let yall know how the Vajrana Ceremony tomorrow Sarurday. Its an all day event and Im counting my fingers and toes. If they are going to talk about the Lam Rim there will certainly be some reading to be done. Great news @Carlita that you’ll have a temple near you soon. Yep. Have another question. I took precepts at a Vietnamese Zen monastary. Would itn appropriopriate to wear the blue robe at a tibetan ceremony? I dont know how informal it would be but In told to wear it infront of monastics during ceremony. Since the two are different sects, its probably opinional. @Carlita, in my opinion, I think it is ok that you can wear blue robe. Base what I hear from Master Haitao. Master Haitao, he is Mahayana monk, but he also a student of the Tibetan 17th Karmapa. The 17th Karmapa told Master Haitao that he does not have to wear the Tibetan monk robe, since he was originally ordained in Mahayana tradition. 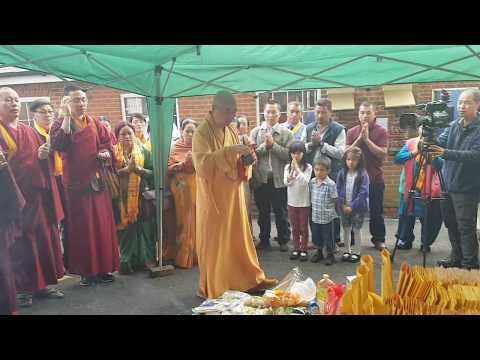 Below is video of Master Haitao at a Tibetan Center in UK, that he is wearing the Mahayana tradition monk robe. "Venerable Master Hai Tao at the Buddhist Community Centre UK"
Hmm. Im readin up on empowerment and it says it means initiation to practice with a given deity. Since anyone is invited can people take empowerment without the precepts? On my way to the ceremony now! Real metta folks. The ceremony was beautiful! It was a ceremony for Buddha Vajrasattva. The ceremony last from 10 a.m. to 4:30 p.m. We all received empowerment from all the buddhas and bodhisattvas. Then we went through The Four Opponent Powers of Purification. Each of us had been individually blessed by Vajrasattva. Too much to put in words. 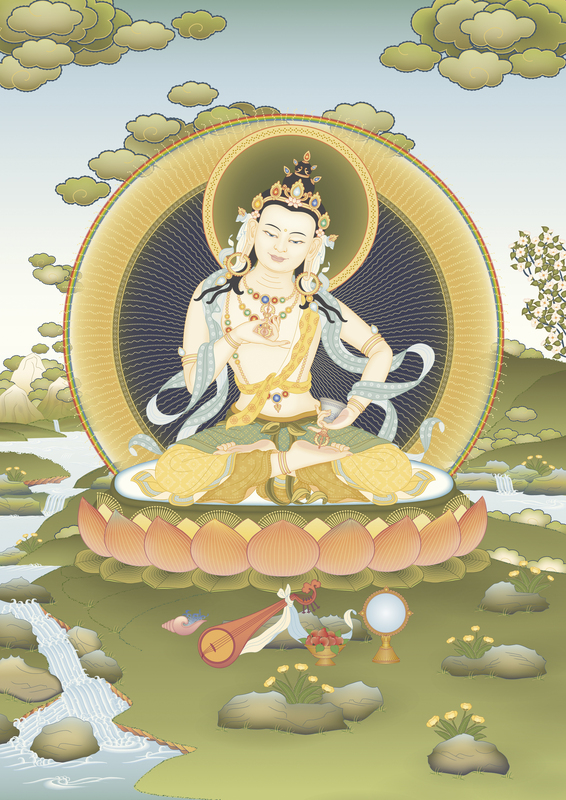 There's a half retreat tomorrow of more visualization practices and blessings from Vajrasattva. Weekly classes of Lam Rim and other classes and rituals at the temple and various centers they have as well. Guys. I kinda feelin off. I went to another buddhist site. I mentioned Kadampa (the only temple near me) and almost got banned on first time there. I read all about it online and on newbuddhist, Im hoping where I dont run across all the mess on these sites. I dont care to out down Any any Buddhist tradition; but, I do value The Dharma and The Buddha and hope the Sangha would be helpful even if going there for classes, dharma talks, and chanting. Im not familar with Tibetan Buddhism. I started practice in Zen, then Nichiren, then formally took precepts at another Zen monastary where I cant go because I dont speak a word of Veitnamese. Neither of these traditions study the suttas much and Im all sutta focused in practice. Anyway. I dont like forming bias and negativity whether direct or indirect. Yes, the term 'kadampa' does not go down well in many zones. If it's the one I'm thinking of. Good for you. Squabbling, 'authentic' dharma cliques/fanatics and my teacher is more realised than your whole sangha, we can get anywhere (no links required). Eventually we begin to hear birds as Buddhas, the enlightened in all people, traditions and Ways. First we must develop respect, positivity, personal discernment and integrity. No need to feel off. People are people and cushions are silenced by sitting on them (lobster top tip). Yeah new temples are all very well and can be wonderful, but there are a few things to watch out for. Temples whose lay groups only come together for rituals are my pet dislike... there is no way into the community or to get to know people if they don’t meditate or discuss sutra’s together. Yeah. All the temples around here seem to be like that. I keep thinking of going to that theravada temple retreat. I have a ride so far I know though its next year spring sonI hope that puls through. Its not public transportation accessable. The other temples here outside Nichiren and Kadampa are foreign. There is a temple kinda near me bus distance when I called the monk spoke broken English. So I may visit there sometime soon after the holidays and cab it back. They have English translation for classes, if Im not mistsken. Im jumping every which a place. Thank you. The people there were nice. They werent pushing their beliefs and need to join as one other temple I visited; American influenced so they have more independent values and community evangalization. I practiced Lam Rim on my own so at meast they are goinf through that. The other site wanted me to look up all the mess behind it. I came across the same thing with SGI and Catholicism; so, I guess people will always be fuming at someone else. But I didnt know at the expense of not considering someone a Buddhist heard in tradition. Lol. Yeah. My grandmother and I used to watch him on PBS. I paint now so I take from his lead. You watched Bob Ross? I like Bob Ross a lot. I came to know him from the recent burst of popularity he got when they put him on Twitch’s Creative channel 24/7 for a few weeks, but I’ve watched a few shows on youtube and I find it really interesting. Yeah. On Amazon Prime, you can watch all his seasons since it's included. I wonder if you'd be interested in the man himself?